The Charles B. Aycock Birthplace in northern Wayne County stands as a memorial to a man who from 1901 to 1905 earned the moniker "North Carolina's education governor" because of his many contributions to the state's public school system. Aycock was born near the town of Fremont (then called Nahunta) on 1 Nov. 1859, the youngest of ten children of Benjamin and Serena Aycock. He graduated from the University of North Carolina in Chapel Hill, where he earned a reputation as a skilled orator, in 1880 and opened a law practice in Goldsboro. He soon became a rising star in the Democratic Party and was elected governor in 1900. His ability to rouse people to support education at the local level and his passionate advocacy of universal access to public, though racially segregated, education for all North Carolina children stimulated the construction of approximately 1,100 schools-one for every day he was in office. 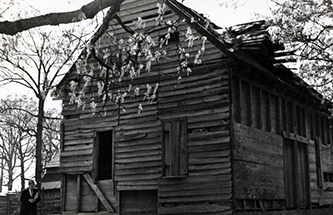 Aycock's birthplace became a North Carolina State Historic Site in 1958. In addition to a mid-nineteenth-century farmstead, including a house, kitchen, and other outbuildings furnished with period pieces, the site includes stables and barns, a one-room schoolhouse (ca. 1893) moved to the site to represent the grassroots educational revival pushed by Aycock, and a visitors center. A number of living history demonstrations are offered throughout the year, as well as educational programs aimed particularly at students studying North Carolina history. Edwin Anderson Alderman, "Charles Brantley Aycock: An Appreciation," NCHR 1 (July 1924). "Aycock Birthplace." N.C. Historic Sites. http://www.nchistoricsites.org/aycock/aycock.htm (accessed November 8, 2012). 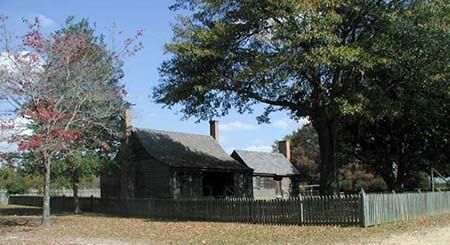 "Aycock Birthplace House To Re-open after Devastating Fire" (press release). North Carolina Department of Cultural Resources. October 22, 2012. http://news.ncdcr.gov/2009/10/22/aycock-birthplace-house-to-re-open-after-devastating-fire/ (accessed November 8, 2012). "Charles B. Aycock Birthplace" Sheltering a heritage: North Carolina's historic buildings. 1969. p.13, 17. http://digital.ncdcr.gov/u?/p249901coll22,642429 (accessed November 8, 2012). "Photo 00160005: Exterior view of the Gov. Charles B. Aycock Birthplace home and kitchen." NC ECHO. 2003-2010. http://www.ncecho.org/ (accessed November 8, 2012). "Photograph, Accession #: H.1954.34.4." 1954. North Carolina Museum of History. Just wanted to say I like this feature of "Ask a Librarian".